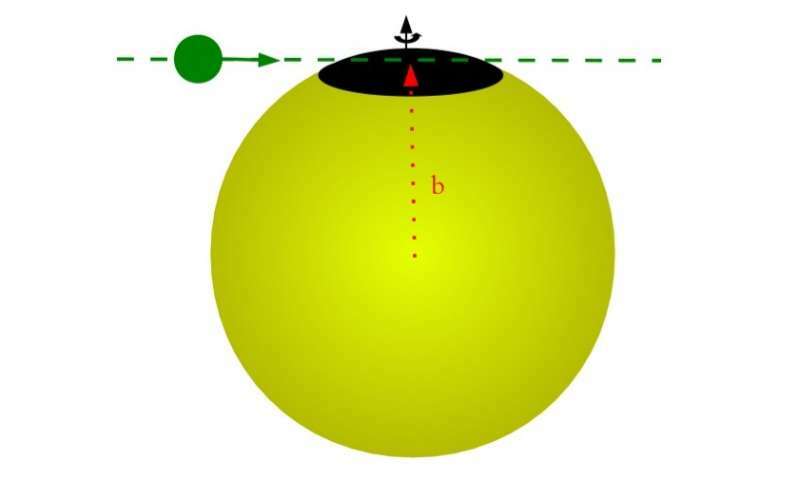 Schematic view of a grazing planet occulting a polar spot. Credit: M. Oshagh et al. (Phys.org)—Exoplanet hunters have so far found hundreds of alien worlds using the transit method. They observe the visual brightness of the star, which drops when a planet crosses in front of the parent star's disk. However, only a handful of grazing exoplanets—meaning exoplanets that partially transit the host-star's disc—have been detected and confirmed. Astronomers from the University of Porto in Portugal blame giant dark polar spots on host stars for the difficulties of finding new grazing planets. Their research appears in the November issue of Astronomy & Astrophysics journal. When a planet passes in front of a star, it blocks out a tiny portion of the star's light, reducing its brightness. If the planet, during its transit, does not fully cover the stellar disk, the planetary transit is said to be grazing. While astronomers have discovered plenty of planets, detecting them as they pass in front of a star, only eight have been detected by partial transit of the star's disk. For example, one of the grazing exoplanets is WASP-67 b, which was detected in 2011. This planet is known to undergo only partial eclipses and its grazing nature was confirmed by a detailed study. The lack of second and third contact makes WASP-67 b hard to track down and complicates accurate measurements of its physical parameters. Prior to the newest research conducted by astronomers from the University of Porto, there has been no study explaining why only so few grazing planets have been discovered. In the new paper, the researchers explore possible explanations for this phenomenon. They point to dark giant polar spots on the host stars. "Our hypothesis to explain the insufficient number of grazing planets is based on the assumption that many grazing planets transit host stars with a dark giant polar spot. As a consequence, the transit light curves disappear due to the occultation of the grazing planet and the polar spot," the researchers wrote in the paper. Large, dark spots located near the stellar rotational axis, either at high latitude or covering the pole, are common features on stars. They are usually much cooler than the stellar photosphere. The occultation of these dark stellar spots by a planet can generate anomalous results when using the transit method and may lead to an incorrect estimate of the planetary parameters. "If a grazing planet crosses a large polar spot, then the transit depth decreases significantly, considering that the limb-darkening also causes a decrease in the transit depth when compared to a central transit," the scientists explain. They assume that this leads to a lower signal-to-noise ratio and may cause the transit signal to be below the detection threshold. The signal could be even completely missed. If so, there should be many more planets yet undetected, including planet candidates that were discovered by NASA's Kepler spacecraft, known as the Kepler Object of Interest (KOI). "We found that more grazing planets should have been detected than have been detected," the paper reads. The list of detected KOIs could contain many grazing planet candidates, but they have yet to be confirmed. The researchers conclude that at least some of them should be real, and if confirmed, they will partially fill the observed gap of grazing transiting planets. They encourage exoplanet hunters to perform more careful analyses when using grazing transit method in the future. Space ranchers wont like this news.